The terrorist who carried out the attack in Givat Assaf stole a weapon from one of the murdered soldiers. 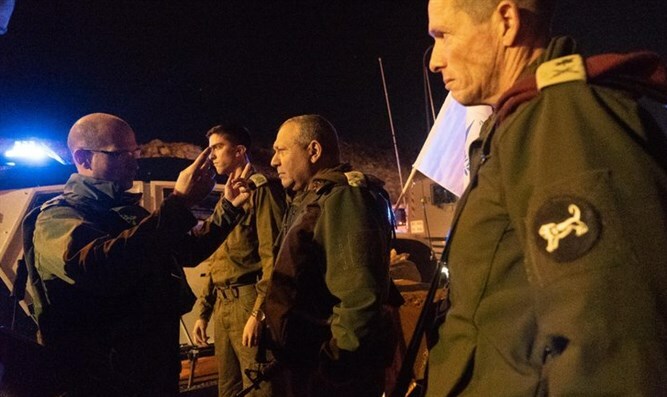 IDF Chief of Staff, Lt. Gen. Gadi Eizenkot, on Thursday evening toured the area of the shooting attack in Givat Assaf in the Binyamin region, in which Staff Sergeant Yovel Moryosef and Sergeant Yosef Cohen were murdered. He also conducted a situation assessment with the Commanding Officer of the Central Command, Maj. Gen. Nadav Padan, the Head of the Operations Directorate, Maj. Gen. Aharon Haliva, the Commanding Officer of the Judea and Samaria Division, Brig. Gen. Eran Niv, the Head of the Civil Administration, Brig. Gen. Ben Hur Achavat and an ISA official. As part of the assessment, the tasks of the Division and reinforcement forces for the near future were presented. Meanwhile, the military censor has cleared for publication that the weapon of one of the two soldiers who were murdered in the attack was stolen by the terrorist from the scene of the attack. In addition to the two soldiers who were murdered, another soldier and 20-year-old Shira Sabag from Beit El were seriously wounded in Thursday attack. The soldier underwent an operation at the Hadassah Hospital in Jerusalem. The operation was complex and a team of experts in neurosurgery and plastic surgery took part in it. After the operation, the hospital said that the soldier's condition continues to be very serious and that his life is still in danger. Sabag underwent an operation at the Shaare Zedek Hospital and her condition is still serious but stable.